Over the last few months, I have enjoyed listening to the concerns and comments of my fellow York County residents. As a result of our conversations, I have become better educated about the issues that are important to you and to our County. Attached to this email you will find my introduction letter, resume, and flyer. It briefly discusses some my leadership accomplishments, my education, and the vision I have for the York County Republican Committee. Tuesday, March 25, 2014 is York County's Republican Mass Meeting. At this meeting, York County residents will determine the direction the wish to see the York County Republican Party take for the next 2 years. I am asking you to come to this meeting and show your support for me as your next York County Republican Committee Chair. If I am elected, I will dedicate my time, talents, efforts, and education to ensure we establish an environment where our ideals and values flourish, while securing victory for Republican candidates. Furthermore, I will commit to establishing an atmosphere where all members of the committee are respected and valued. Before I close, I want to thank all of you for taking the time to speak with me over the past few months. For those of you, who are campaigning on my behalf, I cannot thank you enough for your trust and hard work. Your hard work is very much appreciated. 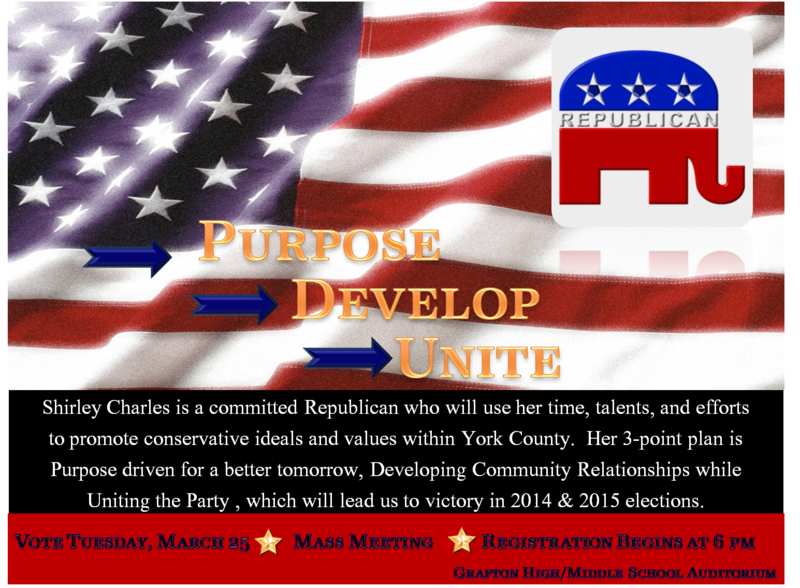 I hope to see you all on Tuesday at Grafton High/Middle School Auditorium. Registration begins at 6:00 pm and the meeting will start at 7:30 pm.